Are your ski boots too loose? 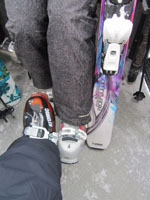 According to ski boot reps, 70-80% of skiers and riders are wearing boots too big for their feet. They also agreed that a proper boot fit is the single most important factor in your ski technique – more significant than the ski or board you are on. A snug fit, and a dynamic but comfortable stance in your boot results in transferring power directly to your ski. Obviously, boot discomfort cramps your style, and shorten your ski day. Ski boots are more important than even the best skis on the market! Buckle Properly: Turns out most skiers start the day on the wrong foot by buckling from the toe up. You should start in the middle to assure your heel hold is snug before clamping the toe buckle or top cuff. The Power Strap: and the power strap is not just a convenient over the shoulder boot carrier– the Velcro strap is designed to tighten the boot tongue against your shin. Bode Miller says its key to ski performance. Full Tilt is a new boot company that resembles the revered Raichle boot of old, for good reason. The designer of Line skis reintroduced Raichle’s patent with a new line up including an expandable kids boot that grows three sizes and park boots like the Tom Wallisch, Full Tilt’s freeskier spokesperson. Fischer has the vacuum boot fit system to the game, claiming the vacuum seal will bring a new level of comfort and performance as your boot is molded exclusively to your unique foot. 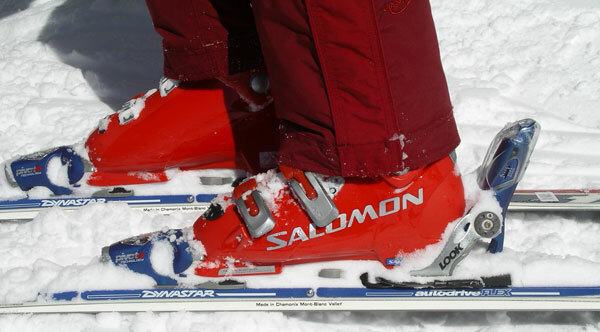 Atomic ski boot’s livefit is revolutionary for a recreational skier with a wide foot. The outer shell actually stretches to accommodate width. Atomic’s flexible sole is also unique, the boot shell actually bends with the ski in a carved turn (though I tried this and found it a bit disconcerting when I felt the lining shift under foot). Dalbello continues to flaunt its unique three piece fit (and Kermit the frog green colors) with a center buckle that offers uncompromising fit and flex. 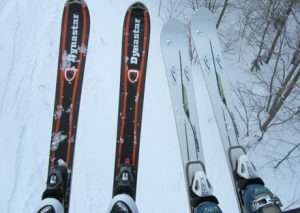 It’s good enough for Glen Plake along when paired with Elan skis. Lange, long known as the real serious stiff, slender racer boot that required modification to fit most feet, has redesigned their line with Control Fit comfort aspect without losing performance. Result: Lange sales are up 85% now that they are wearable out of the box, especially with “choose your width” options. My husband defected from Salomon to the Lange RS after sampling the new comfortable, but still classic blue, boot. Rossignol Electra boots offer a fantastic furry liner, called Sensorfit – I call them super soft. A good boot fit means better turns, and more time on your boards. Or even more basically – if you feet aren’t happy, you aren’t happy.